Damping-off diseases | Infonet Biovision Home. Damping-off (Rhizoctonia solani) on brassica. Pythium spp., Rhizoctonia solani (Thanatephorus cucumeris). Damping-off is caused by fungus and it usually occurs in small patches at various places in the seedbeds or field. 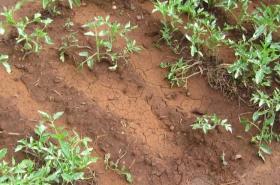 The disease spots often increase from day to day until the seedlings harden. 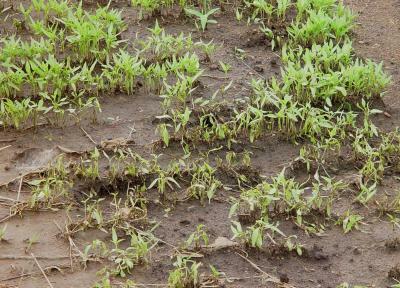 Seedlings are extremely susceptible for about two weeks after emergence. As the stem hardens and increases in size, the injury no longer occurs. 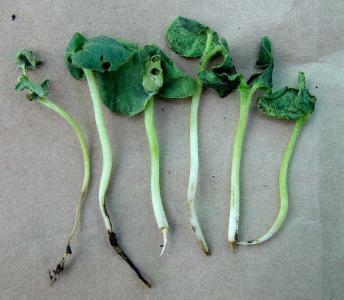 Some seedlings are not killed at once, but the roots are severely damaged and the stem is girdled at the ground level. 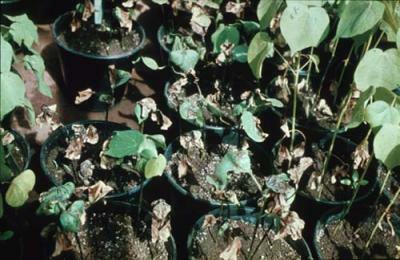 Such plants remain stunted and often do not survive transplanting. Pre-emergence damping off consists of a decay of the germinating seed or death of the seedling before it can push through the soil. This injury is a common cause of poor stands, which are often attributed to inferior quality of the seed or the untreated seeds. Pythium spp. and Phytophthora spp. cause seed decay. Post-emergence damping-off which occurs after the seedlings have emerged from the soil but while still small and tender. 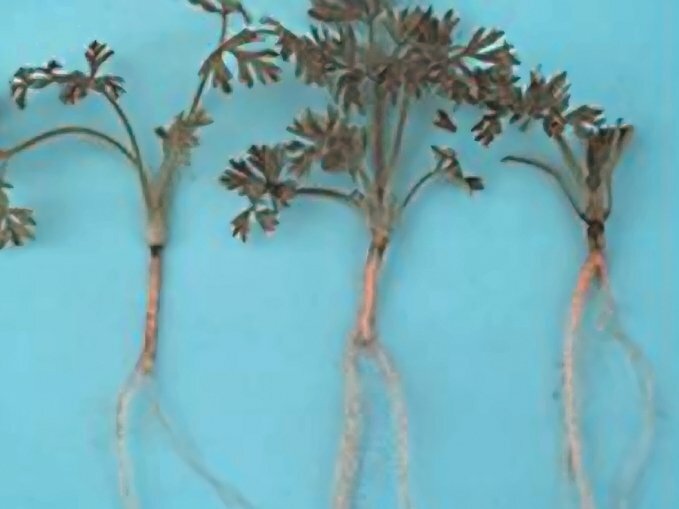 The roots may be killed, and affected plants show water soaking and shrivelling of the stems at the ground level; they soon fall over and die. Post-emergence damping-off is mostly caused byRhizoctonia spp. The fungal disease caused by Rhizoctonia solani has a very wide host range, infecting plant species belonging to 32 families, and 20 weed species from 11 families. 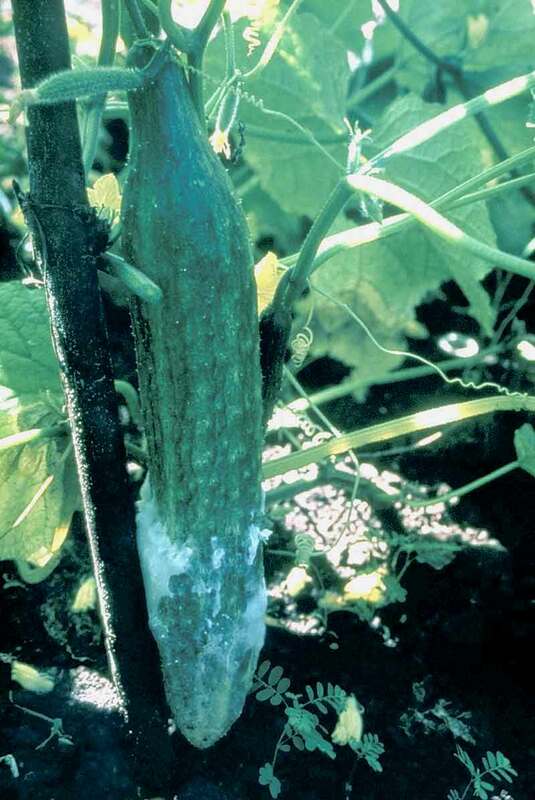 In crucifers, this fungus causes damping-off and wire stem of seedlings in the seedbed; bottom rot and head rot in the field; and storage and root rot of horseradish, radish, rutabaga and turnip. 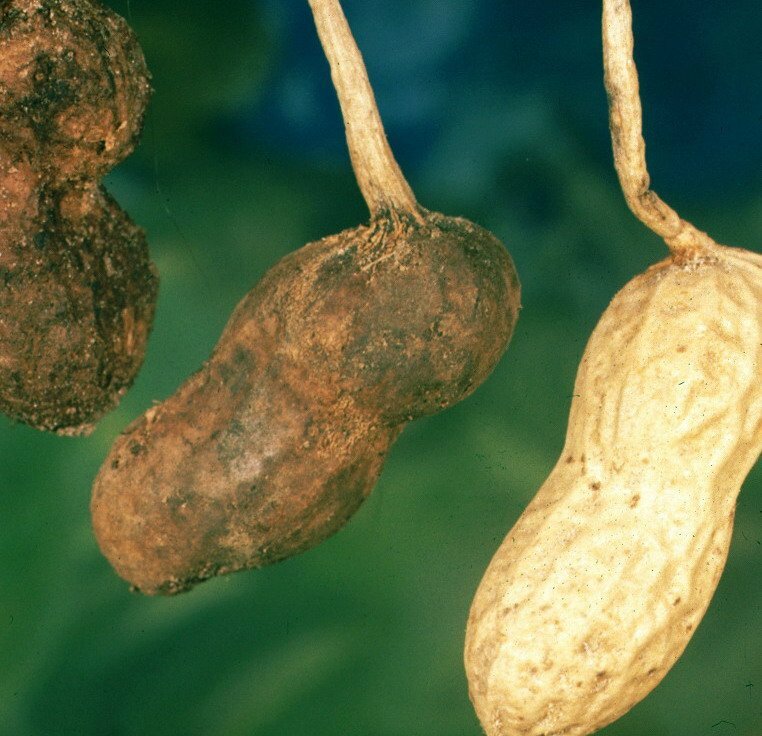 Seeds can decay in cold wet soils and stems can become light brown and water-soaked near the soil line. Such seedlings wilt, topple and die. Wet soils and temperatures at or above 24degC favour disease development. This is the most common and destructive phase of the disease. The stem above and below the soil line shrivels and darkens, and outer tissues come off leaving a dark wiry and woody inner stem. Such plants do not fall over, but they have an unhealthy stunted appearance. Some may die, but most survive and do poorly when transplanted to the field. When moisture is adequate, plants may produce a small poor-quality head. 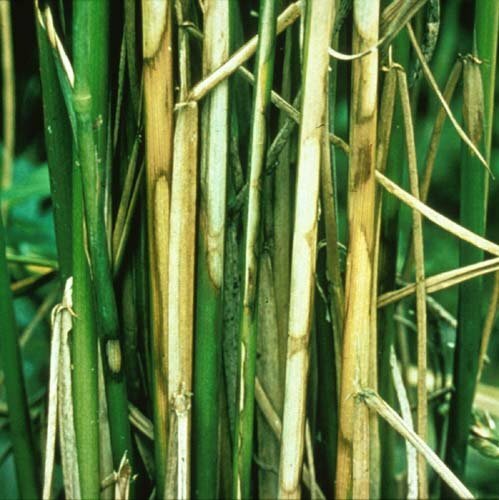 The disease occurs in mid-season as a carry-over from wire stem seedlings and from new infections that occur when outer leaves come in contact with moist infested soil. Lower leaves wilt, decay and turn black, but do not drop off. Some plants may recover and produce heads, but usually bottom rot develops into head rot. 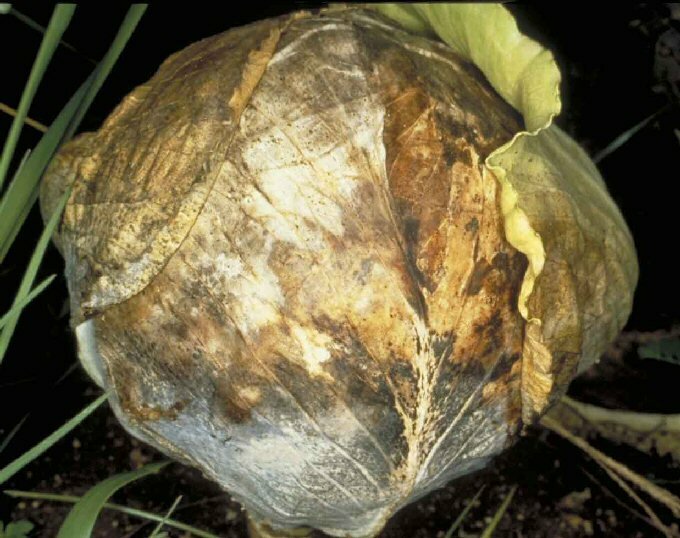 A firm to slimy dark decay at the base of outer leaves and in cabbage heads develops during the period between head formation and maturity. The fungus grows up to main stem, passing between the leaf petioles. Foliage leaves die and drop off, thus exposing the stem beneath the head. Over the whole head surface, brown fungus mycelia and tiny brown resting fungal bodies (sclerotia) may develop and be visible over the head surface. Secondary rot bacteria usually invade the diseased tissue and turn the head into a slimy foul-smelling mass. It is usually dark brown, sunken and spongy. Infected tissues easily separate from advancing edges of the rot. A white to brown surface mould and irregular brown sclerotia distinguish this rot form other root rots. It mainly affects horseradish, radish, rutabaga and turnip. Heading stage (in cabbage), post-harvest (in cabbage), pre-emergence, seedling stage and vegetative growing stage. Leaves, roots, seeds, stems and whole plant. Leaves: lesions; abnormal colours; abnormal forms; wilting; fungal growth. Stems: external discolouration; canker; abnormal growth; mycelium visible. Whole plant: plant death; dieback; damping-off. Many fungi are associated with damping-off diseases and seedling blights. The species most often encountered belong to Pythium spp.and Rhizoctonia spp. For the two an excess of moisture is recognized as the most important condition for damping-off and seedling blights. Heavy seeding resulting in dense planting. Low light and presence of weeds. Exudates derived from host plants stimulate growth of these fungi. Other fungi also implicated in causing damping-off and seedling blights include Aphanomyces spp., Alternaria spp., Botrytis cinerea, Colletotrichum spp., Fusarium spp., Helminthosporium spp., Phytophthora spp., Sclerotinia spp., and Thielaviopsis spp. (3) as sclerotia (tiny brown resting fungal bodies ) (e.g. Sclerotinia spp., Rhizoctonia spp. and Botrytis cinerea). Spread of damping-off fungi depends primarily on the mechanical transfer of mycelia, sclerotia or resting spores in infested soil particles (on flats, tools, baskets or end of the watering hose) or infected plant tissue. Further below you find concrete preventive and curative methods against Damping-off Diseases. Avoid fields with a history of the disease. Use certified disease-free seeds. If using own seed, hot water treatment can be used. For more information on hot water treatment click here. Solarisation of seedbeds should be done where feasible. For more information on solarisation click here. Thin the seedlings in seedbeds to permit good air circulation. Avoid excessive watering and fertilisation, particularly with nitrate. Plant on raised beds to reduce moisture content in the root zone and provide the appropriate drainage in the field to prevent waterlogged conditions. Schedule planting times to avoid temperature and moisture conditions that are conducive to the pathogen. It also will reduce disease severity. As free water is important for distribution and development of the diseases, efforts to reduce soil moisture will help to reduce disease severity. Tomatoes: The seedbed should not be sited on a field previously planted with eggplant, pepper, potatoes, tomatoes or other related crops. Do not site the seedbed next or near to tomato production fields. The seedbed should preferably be up-wind to tomato fields. Brassicas: Seedbeds and production fields should not have had crucifers for at least 3 years. All seedlings with wirestem symptoms should be discarded. During cultivation, take care to avoid throwing soil into plant heads. Okra: Avoid fields previously planted with cotton or other related crops.